A doctor-turned-artist finds peace and inspiration in this ingenious life/work space. Susan Emmerson practiced medicine for 17 years, but she always dreamed of being an artist. In 2010, she enrolled in Lesley University’s MFA program, which allows students to earn degrees mostly from afar — in her case, Bloomington, Illinois. In June 2016, three years after getting her degree, Emmerson moved into a live/work loft in the Savin Hill section of Dorchester, beginning her re-imagined life. 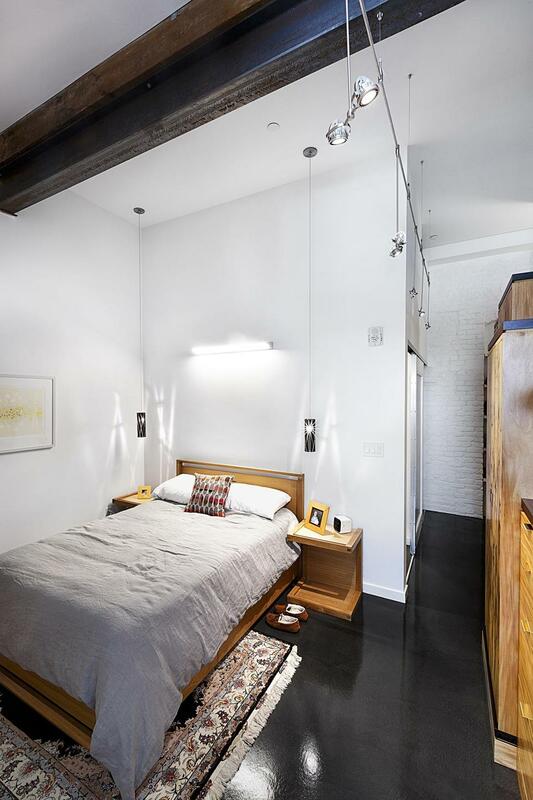 The goal was to create an open living area with a loft-like feel while carving out two bedrooms — the guest room doubles as Emmerson’s auxiliary studio, where she works in mixed media — and plenty of storage. Emmerson, who has two grown sons, had purged most of her belongings in Bloomington but moved with her many books as well as artwork, a grandfather clock given to her and her late husband by his sister as a wedding gift, and her pet snake, Steve. Each precious possession figured into the design. A full wall of built-in bookshelves was the starting point for the space. “I’ve always wanted every book I own to have a spot.” Emmerson says. Larson positioned the kitchen next to the underside of a staircase. Then she designed a rectangular box — an ingenious coat closet — in front of it, turning a pesky flaw into a cool feature. The closet also creates separation between the entry and kitchen, hiding the fridge and Steve’s terrarium. Dark cabinetry recedes into the white space, framing the digitized design of the mosaic tile backsplash. 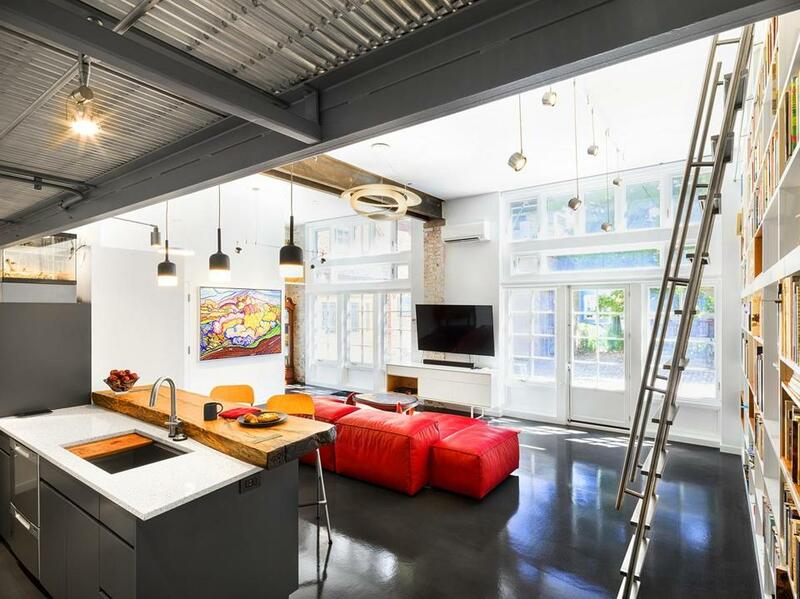 The loft’s overall aesthetic relies on hard-edged lines, with earthy, industrial touches for contrast. The stained concrete floor boasts an epoxy finish with irregular patterning that lends depth. An existing steel beam with a gorgeous rusted patina runs across the living room ceiling, and an exposed-brick niche holds the grandfather clock. The element Larson and Emmerson are proudest of is the live-edge wood slab topping the breakfast bar. It was sawn from one of hundreds of antique live-oak logs discovered at the Charlestown Navy Yard by crews working on the site of the Spaulding Rehabilitation Hospital. There’s even an inventory number stamped on one end. The home’s private spaces — powder room and laundry, studio/guest room, and master suite — lie beyond the kitchen. The catwalk above is a feature Emmerson considered essential to the loft vibe. To create the master closet, Larson closed up one end of a narrow hallway. Homeowner Susan Emmerson chose the furniture herself, starting with the red modular sofa by Living Divani from Casa Design in the South End, from which she also purchased the Andreu World bar stools. Architect Cindy Larson worked with Wolfer’s to choose suspended track lighting with a mix of short and long stems to evenly light the bookcase. Larson moved the entry door to accommodate the 60-inch-wide landscape painting by Bloomington, Illinois, artist Harold Gregor. Larson replaced old wood doors with contemporary floor-to-ceiling windows. 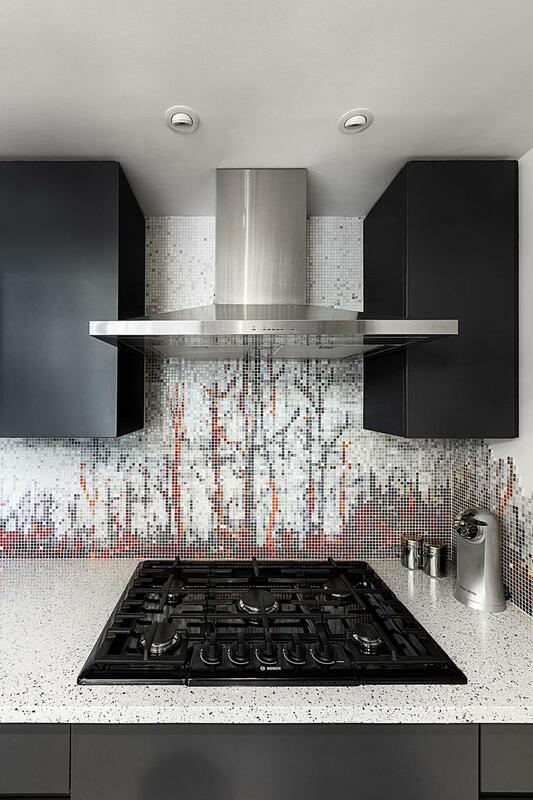 The custom mosaic tile in the kitchen is from Artaic in South Boston. Salem-based North River Design Group built the stained wood cabinetry. A speckled white engineered stone countertop keeps the corner from being too dark. 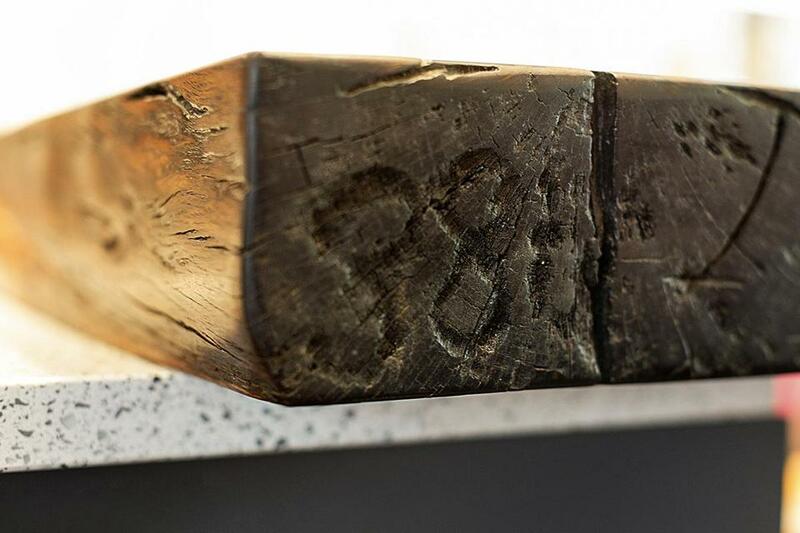 An inventory number is stamped on the end of the kitchen’s live-edge wood breakfast bar. The piece was sawn from one of hundreds of antique live-oak logs discovered at the Charlestown Navy Yard. The master bedroom fits just what it needs. “It’s not a hangout space,” Larson says. 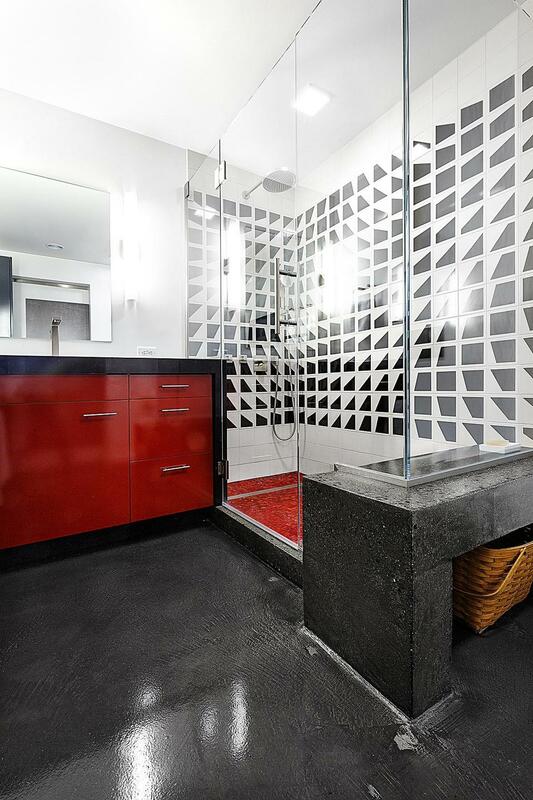 In the bathroom, the glass mosaic tile on the shower floor is “Red Hot Mamma” by Artistic Tile. The black and white wall tile is from Pattern Foundry in London. North River also built the vanity, topped with engineered stone. THREE STORAGE SOLUTIONS in Susan Emmerson’s loft are central to the overall design, devised as much for aesthetic appeal as for function. Bookshelves in the living room are its visual anchor and create a wow moment. But what about when the shelves aren’t filled? To combat blank fields of white space, architect Cindy Larson designed wooden inserts to add visual interest. They also allow Emmerson to display small-scale objects and artworks in spaces that are otherwise too large. 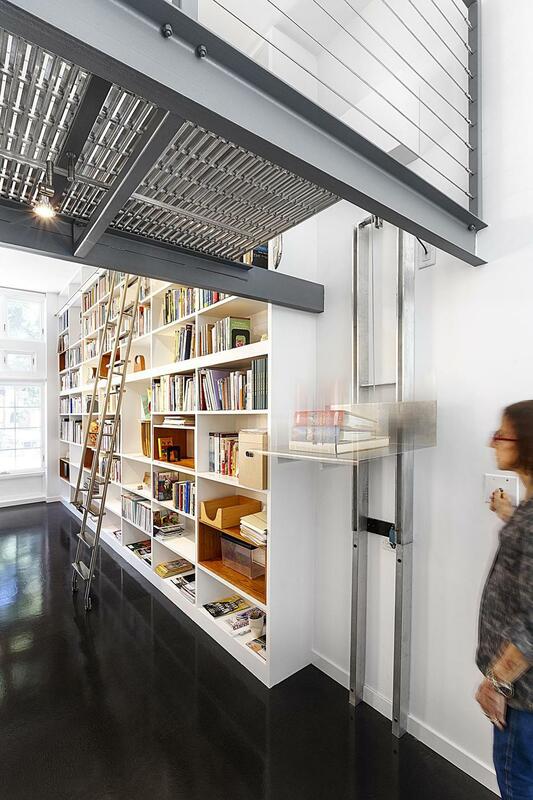 A sleek library ladder runs across the entire expanse and folds up flat. 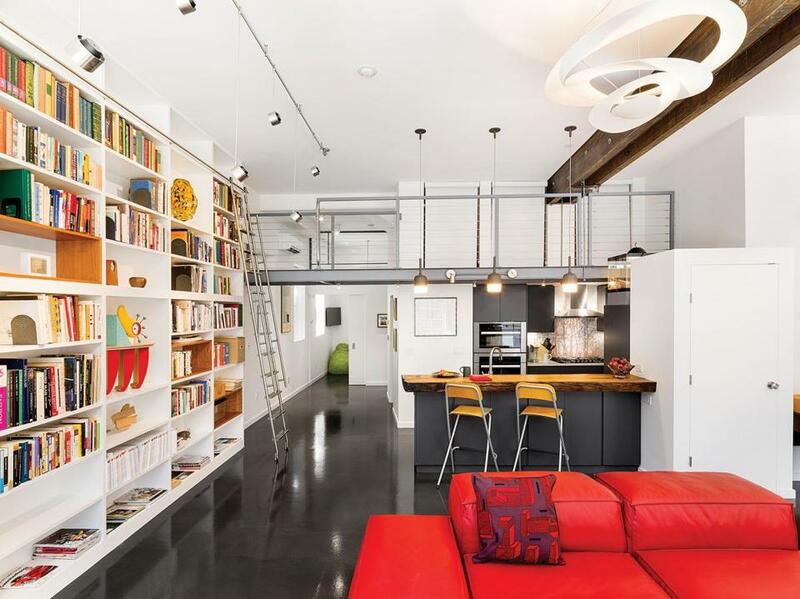 Emmerson’s vision of an artist’s loft included a catwalk, and thanks to 12-foot ceilings, Larson could comply. It became as much a practical element as an ornamental one once Larson carved a trio of storage niches at the top of the wall above the kitchen. An industrial hydraulic lift mounted to the wall allows Emmerson to easily transfer heavy items. Emmerson on the catwalk next to built-in storage bays. 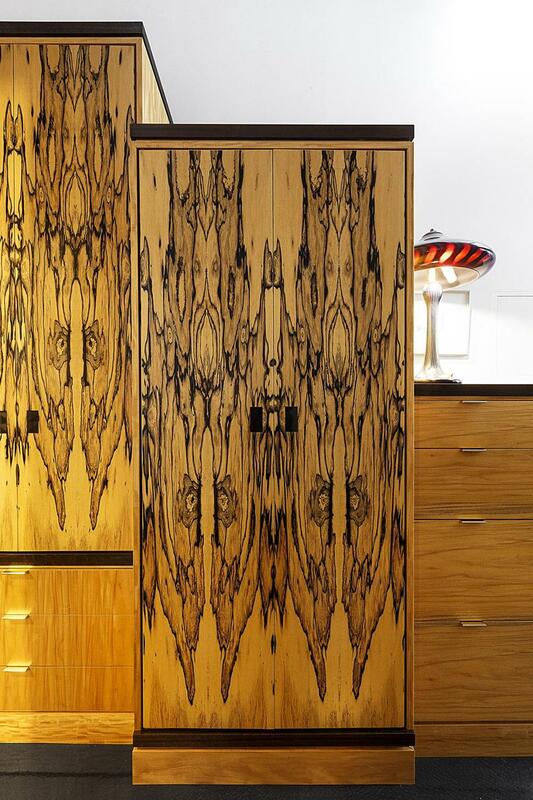 The bedroom built-ins are functional works of art. 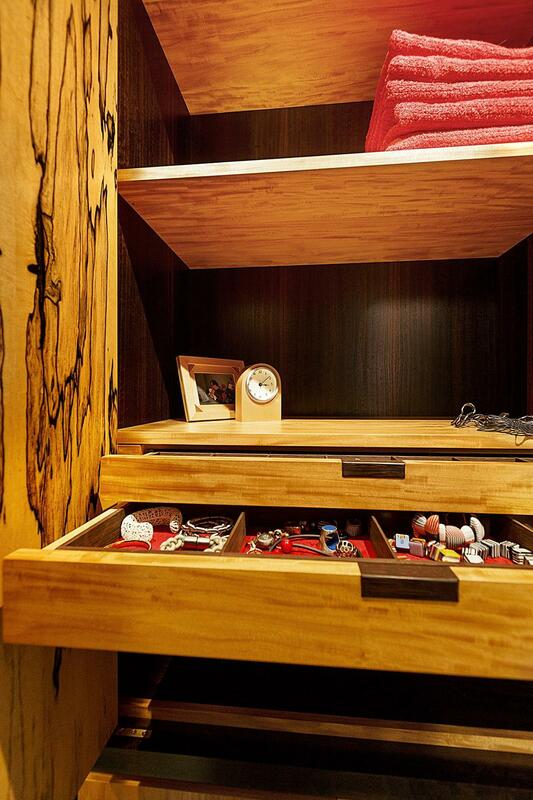 Jewelry drawers in the bedroom cabinetry. Marni Elyse Katz is a regular contributor to the Globe Magazine. Send comments to magazine@globe.com. Follow us on Twitter at @BostonGlobeMag.